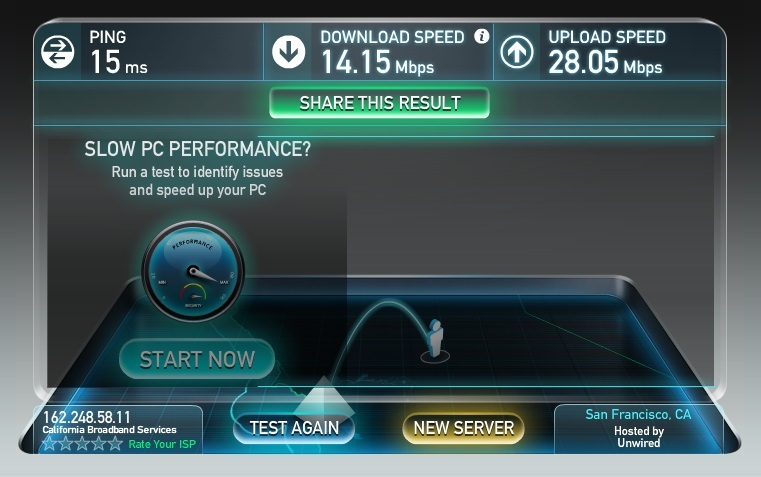 If you would like to check the download and upload speeds (bandwidth) on your computer or other Internet access devices, go to OOKLA SPEEDTEST and click on the BEGIN TEST tab. After a few seconds your results will display on a virtual computer screen - as seen on the image to the right. The result of your speedtest shows your available bandwidth. This will be your total bandwidth capacity, minus the amount of bandwidth currently being used. If very little bandwidth is being used on your Internet Service when you run a speedtest, then the speedtest result will be very close to your total bandwidth capacity, that is, the total amount of bandwidth available for you to use on your Internet Service. However if any other devices are also being used to access your Internet Service when you run a speedtest, then the speedtest result will show the net difference between your total bandwidth capacity and the combined bandwitdth usage of all your devices. For example, if someone in your household is watching Netflix, using 3Mbps of bandwidth, and your total bandwidth capacity is 8Mbps, then when you run a speedtest from your computer the result will be 5Mbps of bandwidth - the difference between the 8Mbps capacity and the 3Mbps currently being used. The graphic below illustrates the difference between usage and capactiy. The bandwidth usage is shown under the Throughput heading. RX represents the bandwith received, or download speed. TX represents the bandwidth transmitted, or upload speed. As you can see in this graph, the download capacity is 115Mbps, while the download usage is 19.3Mbps. The upload capacity is 46.6Mbps, while the upload usage (of that total capacity) is 914kbps. Therefore, be sure to consider your total household or business usage of bandwidth when interpreting your speedtest results.